I'm going somewhere that I haven't gone in a long time, into Ginger beers. Alcoholic Ginger beers tend to let me down, they normally promise alot and taste pretty poor. Kiuchi would be one of the breweries that I think could pull off this style. The Kiuchi brewery is one of the oldest breweries in Japan, having been first founded in 1823. 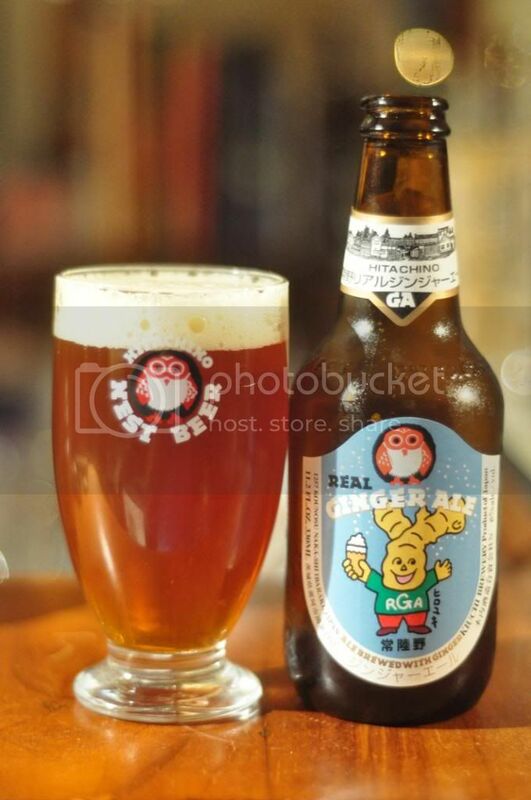 The now famous Hitachino range, with it's unique owl logo, was launched in 1996 and is now one of the most respected micro breweries from Asia. The brewery has won many awards and it's quite rare to not be able to find one of their beers at my house, making it so odd that this is the first beer of their's that I have reviewed. When the Hitachino Real Ginger Ale is poured I was pleasantly surprised by the appearance. It had a lovely golden/amber colour and reflected the light brilliantly. The head was a cream colour with some large air bubbles through it. The retention and lacing was minimal but I can say that about every Ginger beer I've ever had! Overall it's one of the best looking Ginger beers I can think of. Unsurprisingly Kiuchi Brewery's Real Ginger Ale smells like ginger. After that somewhat shocking discovery there's very little else on the nose, maybe there is the tiniest hint of a light pale malt body but it's very thin and I'd be clutching at straws if I actually claimed it was obvious. Basically this beer just smells like nice spicy ginger. The beer had more flavours than the nose suggested it did, which would normally be a good thing. Unfortunately I didn't think alot of them added anything to the overall beer other than to make it seem slightly mediciney. There was plenty of ginger and some really unusual pale malts with a hint of fruit flavours as well, it might be pear but I can't quite place it. The ginger and malts certainly provided plenty of zestiness and spice but it just really clashed for me. Overall I have to say that I'm quite disappointed after a promising start. The appearance really got my hopes up that this would be the first alcoholic Ginger beer that I would really enjoy, but sadly the odd flavour in the end proved too much. I did manage to finish it but it was definitely a beer that I did not enjoy at all and probably wouldn't drink if I was given another one for free. I certainly wouldn't have another one but maybe if you're a ginger beer aficionado it could be up your alley. Hi! Just wondering where you found that glass & how much it costs? Love the logo!